Damp indoor air can foster the growth and transmission of viruses and bacteria-living organisms that cause diseases, like the common cold, coughs, influenza, tuberculosis, or other infectious agents. These infections can easily become airborne through simple sneezes or coughs. Offices and waiting rooms with poor air circulation are perfect environments for spreading germs like the ones mentioned above; but to keep germs from traveling through the air, you must control or mitigate biological contaminants, including bacteria, viruses, animal dander, mites, cockroaches, and pollen, as many of them are small enough for building occupants to inhale. There are many sources of these pollutants, which include damp or wet areas, such as cooling coils, humidifiers, condensate pans, and carpeting. Controlling moisture in these types of indoor spaces can limit the spread of infectious diseases and also limit mold, dust mite, and cockroach growth. Sufficient clinical evidence shows that occupants of damp or moldy buildings are at increased risk of respiratory symptoms, respiratory infections, and exacerbation of asthma. Below are six critical ways to mitigate this risk by reducing infections and the spread of germs through the air. Many buildings are designed to be airtight in order to cut down on energy costs and be more sustainable. This often leads to inadequate ventilation. Ventilation is effective in keeping bacteria, viruses, and other pollutants out of the indoor air. Research shows that air flow and ventilation can affect how diseases spread indoors. Some diseases associated with exposure to toxins from microorganisms grow in a building’s ventilation systems. The more stagnant the air, the more likely diseases are to spread. 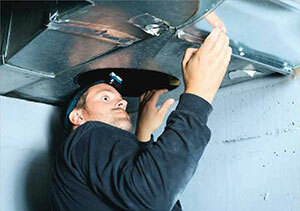 Ventilation can also aid in limiting the spread of these pollutants. A lack of proper ventilation can also cause other problems, such as moisture buildup and mold growth. This is especially common in older buildings because they may contain hazardous building materials such as lead or asbestos, adding to the list of unsafe contaminants that linger in limited airspace. Dust mites are the source of one of the most powerful biological allergens. They grow in damp, warm environments. Dust mites are not visible and mostly develop due to skin cell fragment shedding. Since each person is different and may come in contact with different surfaces within a building, it is difficult to determine where dust mites originate. Sampling can help to determine the amount of dust mite allergens. Dogs and cats secrete fluids and shed dander-containing allergens, which collect on fur and other surfaces. Even if an animal is not in the building, pet dander from a coworker’s clothes and skin will move through the office air. Sometimes these allergens linger in the air for up to several months. Dust mites, along with pet dander, can trigger asthma and allergy-like symptoms; however, proper cleaning techniques can help to mitigate allergy complaints. Most office buildings do not allow pets, so dust mites are typically the main focus. Too much moisture in the air is nearly the same as having a leak in the building. A relative humidity of 20 to 60 percent is the recommended range set by ASHRAE-an association focusing on heating, ventilation, air conditioning, and refrigeration-for commercial buildings. Humidity levels above 60 percent can allow for fungi (mold) to colonize on surfaces. Understanding the importance of controlling humidity in a building is key to successful occupant comfort. Most office buildings and even medical office buildings do not monitor humidity levels. By controlling the relative humidity, you can minimize the growth of some sources of biologicals. Besides monitoring the relative humidity, it is also imperative to eliminate any standing water, report leaks, and be on the lookout for mold developing on any surface. Standing water, water-damaged materials, or wet surfaces can serve as a breeding ground for mold, bacteria, and insects. Sometimes mold from elevated humidity can appear as light fuzz on surfaces or give the appearance of slight water stains on drywall ceilings or walls. In the early stages of colonization, you can only see the mold if you shine a light parallel to the surface. The efficiency of the air filter is based on the size of the particles it captures. The higher the efficiency, the more effective it will be. Look for the filter’s Minimum Efficiency Reporting Value (MERV) number, the industry standard for rating filters based on performance. Commercial building managers should look for a higher rating, ranging from 10 to 16, indicating more efficient filters. Higher filter efficiency not only helps clear the air, but it also improves airflow. Purchasing a high-quality air filter is a long-term investment, but will last longer and keep the air quality better for building occupants. It is also important, however, to change the air filters regularly, not only to maintain good indoor air quality, but to insure your heating, ventilation, and air conditioning (HVAC) system doesn’t have any other issues. Vacuuming carpets, rugs, furniture, hardwood floors, and even curtains are vital for improving a building’s indoor air quality. A vacuum cleaner with a high-efficiency particulate air (HEPA) filter is one of the most highly recommended solutions to lessen the amount of indoor allergens that may be in your building. Americans spend a significant amount of time indoors-at least one-third of the work day is spent in an office setting. As a result, indoor air quality concerns are a fact of life for building owners, business owners, and managers. Poor indoor air quality is a much more common, and much more expensive, problem than many facility managers may realize. It is not possible to satisfy every building occupant at all times; however, it is possible and necessary to provide a work environment that is healthy and safe. Infectious illnesses-such as influenza, measles, and chicken pox-can transmit through the air. Molds and mildews also release disease-causing toxins. • Long-term healUl problems, such as respiratory and cardiovascular disease.